Chicken Noodle Soup is a great staple when it comes to warm comfort foods. 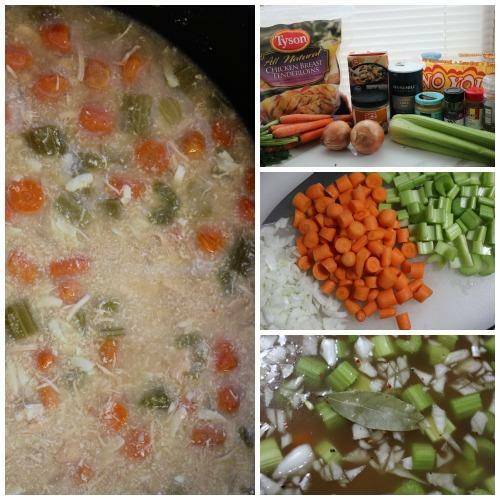 Be sure to check out this Crock Pot Chicken Noodle Soup Recipe to add to your collection! Your family will love this Crock Pot Chicken Noodle Soup Recipe. I love crock pot recipes that are easy and taste delicious! This is a great recipe for when you know you will be home late and need to start something early. Make this on a cold winter’s night, or if one of your family members is feeling under the weather. Chicken Noodle Soup is great any time of the year, so be sure to print off this recipe and keep it close to your kitchen! This is a staple recipe that your entire family will love. Plus, it is pretty healthy too! 1 12 oz bag Egg Noodles. Don’t forget that you can always add a little extra salt and pepper to taste! I love pepper, especially on Chicken Noodle Soup! Try this tonight with you family! You can also check out my Mini Taco Bowls Recipe for another quick and easy meal idea!